Atwood's Printing : Special Offers : Pens, Pens, Pens!!! 2012 Calendars - Order Now! Click this image for a focused search for pens. 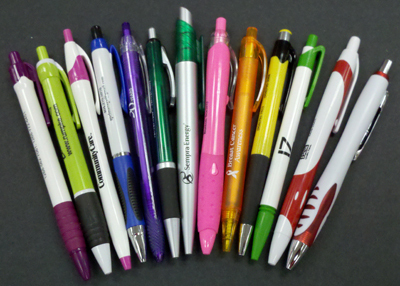 Pens are one of the best items for leave behinds, trade show giveaways & client appreciation gifts. Atwood's Printing is a supplier of hundreds of thousands of advertising specialty items. Pens are one of the most popular indeed. At last search we had access to over 30,000 types of pens. Short, fat, skinny, strange, assorted ink colors, Inexpensive to luxurious, no matter the pen type, we have you covered! If you have questions about any pen or other special item that you may be looking it, please don't hesitate to contact the Ad Specialty professionals at Atwood's Printing.